Outdoor Education | Editor's Note | Kids VT - small people, big ideas! In late March, my partner and I brought our kids to Shelburne Farms for the annual Maple Open House weekend. All of us love maple syrup, and we had talked in advance about the mechanics of sugaring. But when we got to the Shelburne Farms sugarbush, Graham, 5, didn't race to the sugarhouse. And he wasn't that jazzed about sampling a cup of syrup. What he really wanted to do was climb on a mound of snow at the edge of the footpath. He called it his snow fort. He recruited his 2 1/2-year-old sister to help him find snowballs and sticks to use as "shooters." The two of them ran around battling bad guys and trying to save babies. Or something. After about 10 minutes of this, I tried to pry them away from their game. "Don't you want to see them boiling sap?" I asked eagerly. "Don't you want to see how they tap the trees?" "No," Graham calmly replied. "We just want to play." I tried again to persuade them, to no avail. I was a little disappointed, until I realized that it was a beautiful, sunny day, and my kids were playing outside, making up their own game with whatever they found on the ground. 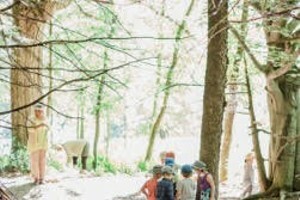 That's the kind of unstructured, outdoor free play that environmental educator and author Richard Luov champions in his 2005 book, Last Child in the Woods: Saving Our Children From Nature Deficit Disorder. Luov's book figures prominently in this month's cover package of articles, "Go Wild: Getting Your Kids Outdoors," on page 18. I remembered that, and I let them be. We did eventually wander over to the sugarhouse, then stopped by the farm barn to see the baby lambs. But I think what the kids enjoyed most about our visit was playing in the snow, and that's OK with me. On our way home, we stopped at the video store to pick up a movie to watch before dinner. I wished I'd had a copy of Margot Harrison's list of films featuring great girl characters. You'll find her recommendations on page 15 of this month's issue.